We’ve been having a few cockerel issues lately. Aramis (as he is now known) has started charging at us during corn feeding times and giving our legs one good peck with his beak. We thought it was hunger as sometimes the pellets would run out during the day but he continued to do it even on days we kept on top of the pellets and even after all the corn had been given out and his girls were still pecking happily away at the ground. Sam ran after him the last time he did it and so far so good but he gets one more chance. If he does it again he is in the pot. To be honest he may end up in the pot anyway. 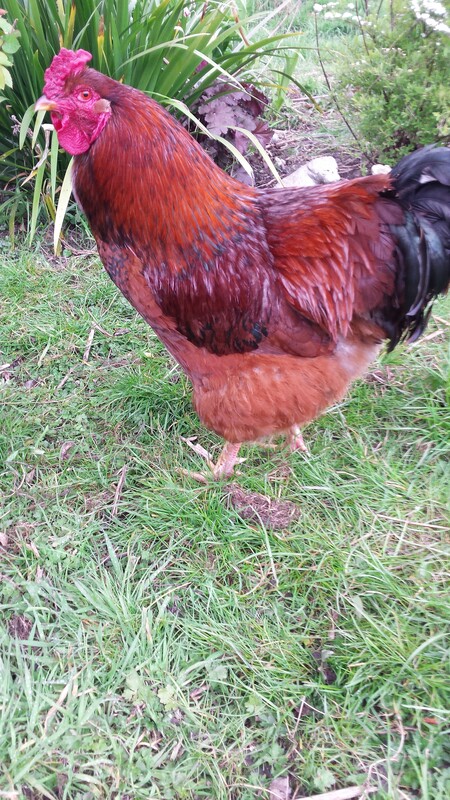 He’s a lovely looking boy and he does well showing the girls food and keeping them safe (he gets them all on red alert when one of our cats walks by). 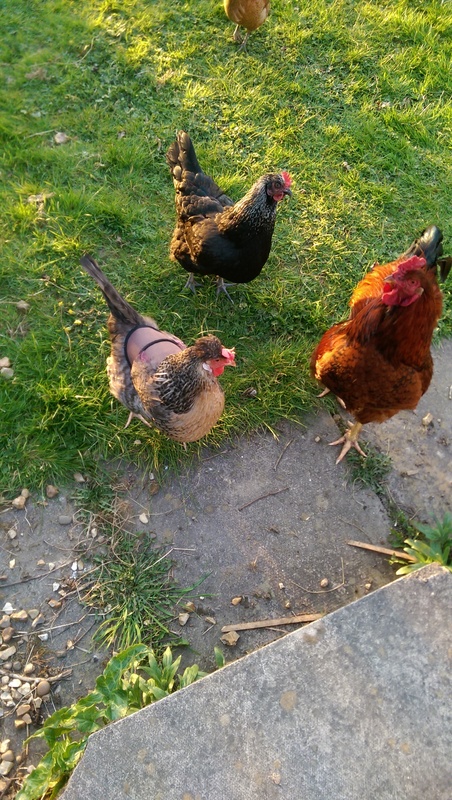 On the downside though we have to keep the eggs in the fridge and he has a favourite hen who is getting her back feathers damaged by his affections. We’ve had to resort to buying a saddle for the poor girl. On top of that he is another mouth to feed, and a big one at that! 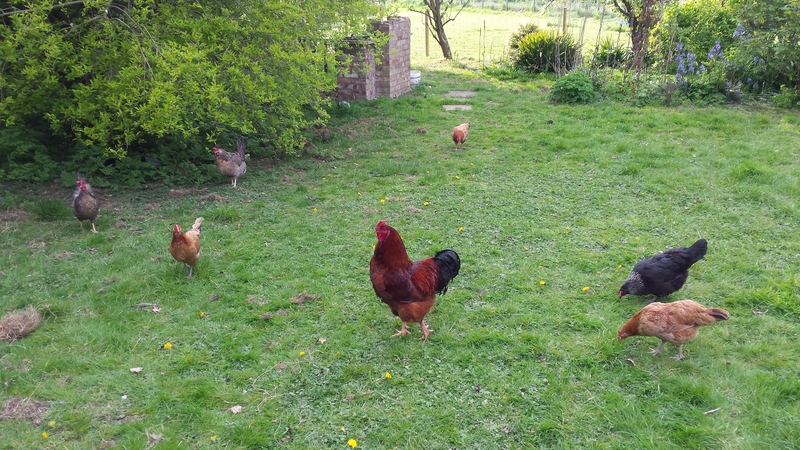 Just need to get myself booked onto a course to learn how to humanely dispatch chickens or have someone show me. Whatever happens I want his end to be quick and utterly unexpected for him. 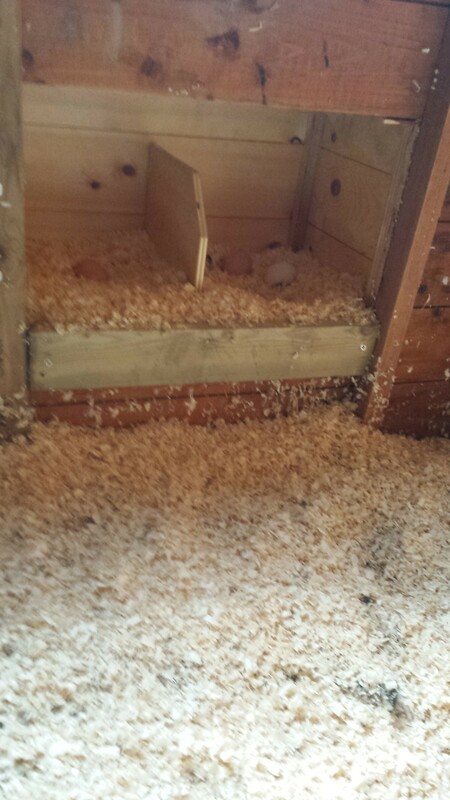 We’ve also been having nest box issues with the chickens. 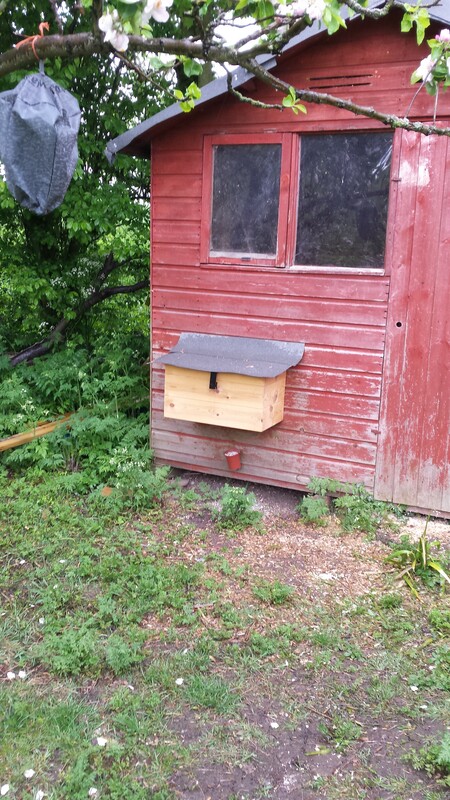 We bought two nest boxes to attach to the side of the chicken house but we put them a little bit too high up I think. Nevertheless we did get a couple of eggs in them but then it rained and the boxes leaked. The tongue and groove joints weren’t done very well. We ended up putting an Ikea storage box in there on it’s side which has actually worked really well. We had 5 birds using it though which is too many (one of the Brown Marsh Daisies has made a nest underneath the house). We felted the roof of the box now though and the Norfolk Grey is happily using so I am hoping the others will follow. On a good day we are getting 4 eggs that are suitable for selling (we only sell them if they are over 50g, not too dirty and not ridged at all). Two of the Brown Marsh Daisies are still laying very small eggs and the Norfolk Grey has a really ridged egg every 2 or three days. Not the best layers I guess. 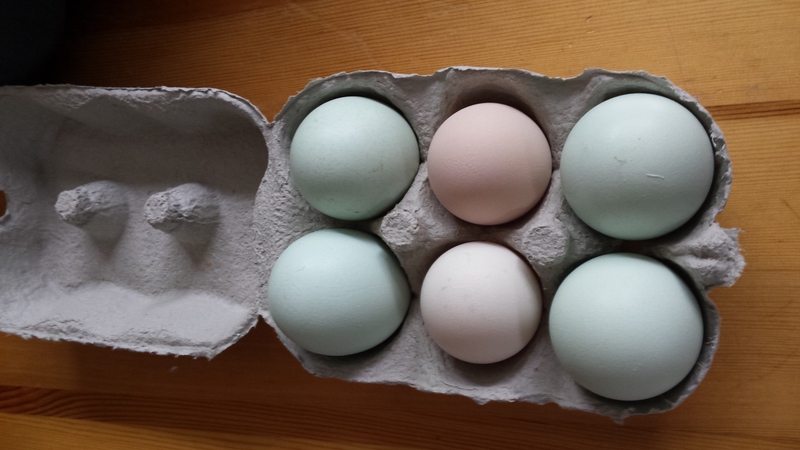 The Cream Leg Bars are doing a great job though, we sometimes even get large eggs from them and the blue shell is a draw for some of our buyers. We’re doing quite well selling eggs to family and friends and are now looking at getting some more chickens, laying some eggs that differ in colour to the ones we already have. 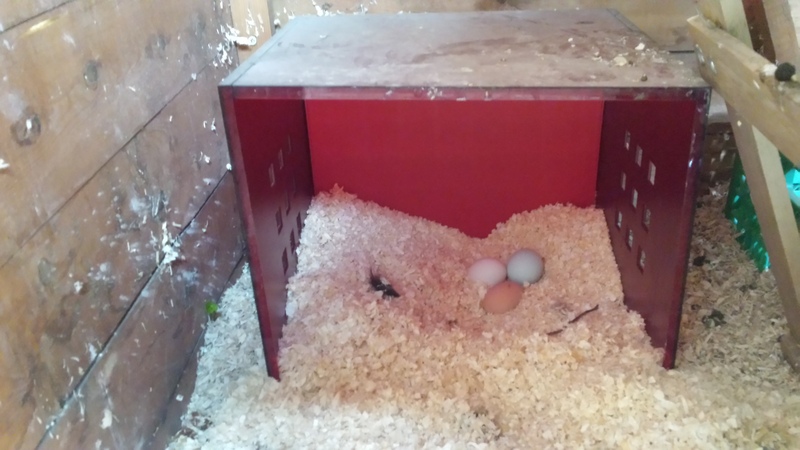 We need to re-paint the hen house first though and get another nest box in (probably another Ikea box as it is working well). I’m thinking that we will wait until July for more chickens as that’s when the next round of worming is needed and buying then will mean that 1) the new girls get a quarantine treatment, 2) everyone is kept inside to allow them to sort themselves out so they will eat all the pellets and get a good dose of the wormer.